This 12 day Uganda Gorilla, Chimpanzee & Wildlife Safari features the famous African Big 5, as well as Mountain Gorillas and Chimpanzees! 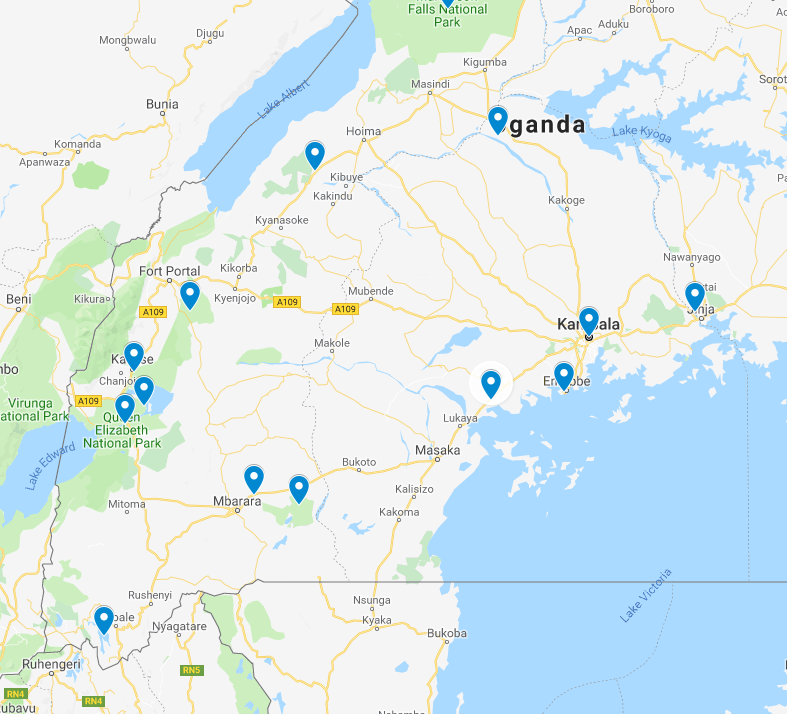 The trip starts and ends in Entebbe and features some of Uganda’s premier safari and wildlife destinations, covering Ziwa Rhino Sanctuary, Murchison Falls National Park, Kabwoya Wildlife Reserve, Kibale National Park, Queen Elizabeth National Park, Bwindi Impenetrable Forest and Lake Mburo National Park. It provides for a journey break between Murchison Falls National Park and Kibale National Park at the shores of Lake Albert, and then a second night in Kibale to enable a relaxed transfer to Queen Elizabeth National Park the next day. You will arrive in Uganda at the famous Entebbe International Airport located on the shores of Lake Victoria on the magical Entebbe peninsula. The fresh air and tropical sun will make you feel right at home in the “Pearl of Africa”. You will find a company representative at the arrival waiting area who will brief you about Uganda and the safari in particular before transferring to the respective hotel for relaxation, dinner and your overnight stay. Transfer to Murchison Falls National Park, a 5 hour drive excluding stops en route. We will drive through impressive stretches of the Nakasongora district before branching off at Nakitooma for 7km to Ziwa Rhino Sanctuary to track white Rhinos which are only found here in the whole of Uganda. This will be followed by lunch at Kabalega, and then we continue to Murchison Falls National Park arriving in the evening for relaxation, dinner and overnight stay. This morning we will drive to the northern section of Murchison National Park for a morning game drive offering impressive game viewing encounters. The 3 – 4 hour activity takes you through the designated park tracks including Buligi, Queen, Albert and the entire delta area with possibilities of encountering Lion, Elephant, Rothschild’s Giraffe, Leopard, Jackson’s Hartebeest, Waterbuck, Oribi, and Kob among others. The open savannah grassland with scattered Borassus palms also present a unique landscape worth viewing. We then return to the lodge to relax and have some lunch after which we will gather at Paraa jetty for afternoon boat cruise to the bottom of the falls. The 3 hour boat ride takes you on the thrilling Nile waters in their relaxed flow as they join the Albert delta. The views of Hippo, Nile crocodile and the iconic sought-after Shoebill might impress you along the adventure. Upon arriving on the bottom of the falls, you will embark on the hike to the top of one of the world’s most powerful waterfalls. The Nile river forces itself through a rocky gap less than 8 metres wide before falling 43 metres to what has been termed the “devil’s cauldron” below, forming a plume of spray marked by a thunderous roar and trade mark rainbow. After the activity we return to the lodge for relaxation, dinner and our overnight stay. After a relaxed breakfast, we take a very scenic drive to the Albertine rift area marked with incredible steep escarpments, the extensive rift valley flats and beautiful views of Lake Albert and the distant Blue Mountains in the Democratic Republic of Congo. You can choose to visit the 900 year old Kibiro Salt mines en route to explore the traditional salt extraction practices or proceed to the lodge to spend the afternoon at leisure or do a game drive in Kabwoya Wildlife Reserve. After a relaxed breakfast, we will embark on the transfer to the Fort Portal area enjoying countryside views. Upon arriving in Fort Portal, you settle in for lunch at one of best restaurants in town. After lunch you have the option to cycle in the Mpanga tea estates, where workers still harvest the tea leaves by hand. The green tea plantation is spread over a beautiful undulating landscape with endless scenic views which makes it ideal to experience on your mountain bikes. Alternatively, you can opt to visit the Amabere g’ Nyinamwiru Caves and hike the Fort Portal Crater Lake field. Upon arrival, you are welcomed by the local inhabitants, who have a deep understanding of the history of the place. You visit the Amabere g’ Nnyinamwiru caves – the breast like features believed to have belonged to Nyinamwiru the daughter of Bukuku who was a self-enthroned King of the Bachwezi. She was denied the opportunity to breastfeed her baby Ndahura as the father had been alerted that the child will take over his throne. The “milk” continues to flow out of Nyinamwiru’s breasts in the form of stalactites in the caves. After this encounter we embark on the hike to the Fort Portal Crater Lake field where you traverse the challenging slopes of Kyeganywa hill, surrounded by a range of crater lakes and crater hollows presenting one of the beautiful scenic sites in Uganda. The top of Kyeganywa hill offers views of Rwenzori Mountains on a clear day. After your chosen afternoon activity we transfer to Kibale National Park for relaxation, dinner and our overnight stay. Gather at Kanyanchu Tourism Center in Kibale National Park to catch up with Chimpanzee trekking which begins at 8am. The encounter commences with a briefing from the respective park rangers who will be your guides through the activity. After this, you head to the forest in search of man’s closest relative. The dense forests of Kibale NP comprise of lush flora with mature trees marked with huge buttress and climbers. There are impressive bird species including the African Pitta, Afep Pigeon, Green-breasted Pitta, White-naped Pigeon, Red-chested Owlet, Crowned Eagle, Black Bee-eater, Yellow-rumped Tinkerbird, Western Nicator, Blue-breasted Kingfisher, Brown-chested Alethe, African Grey Parrot, Brown Illadopsis, Scaly-breasted Illadopsis, Black-capped Apalis, Collared Apalis, Blue-headed Sunbird, Dusky Crimsonwing, Red-faced Woodland Warbler, Purple-breasted Sunbird and Abyssinian Ground-thrush among many others. Apart from chimps, Kibale also supports 12 other Primate species including the threatened Red Colobus, the rare L’Hoest’s monkey, Black-and-white Colobus, Grey-cheeked Mangabey, Red-tailed and Blue Monkeys, Bushbaby, Olive Baboon and Potto. Finally you approach the Common Chimpanzees (sometimes called the Robust Chimpanzee) which have been fully habituated and thus offering you an opportunity to draw closer to them and take pictures. Viewing them as they munch fruit, swinging in trees, socializing, patrolling, mating and making hooting calls is an unforgettable experience. You have a full hour to enjoy these precious creatures and you are free to take as many photos as you wish. You then return from the activity which tend to last 2 – 5 hours in total and get back to the starting point where you will rejoin your company safari guide and enjoy your packed lunch. Afterwards we transfer to Bigodi Wetland Sanctuary. The sanctuary is a famous successful community tourism initiative presenting a magical walk in its communally controlled wetland with possible sightings of up to 138 species of birds including the Great Blue Turaco, Papyrus Gonolek and a range of hornbills. The sight of the swamp dwelling Sitatunga antelope that is resident in the swamp is also special. The walk offers a glimpse into the lives of the of the community, including the home of a traditional healer. An extension to the local school can also be arranged. The range of arts and crafts at the centre put together by local women offers you an impressive look at the local expertise. After this activity we embark on the transfer to the lodge to relax, have dinner and our overnight stay. After breakfast, we embark on the transfer to Queen Elizabeth National Park (157km) for about 2 – 3 hours’ drive enjoying the scenic views en route before making a stop in Kasese on the foothills of Mount Rwenzori to explore the Ruboni Village. We will experience the cultural traditions of the Bakonzo people that have lived on the foothills of Mount Rwenzori for centuries. We will learn about their way of life, the crops that they grow, livestock that they keep, their art and craft not forgetting impressive music, dance and drama. After this encounter we continue on the drive to Queen Elizabeth National Park for an afternoon game drive exploring the impressive landscapes of “Queen” with the beautiful views of the savannah at sunset after which you retire for relaxation, dinner and a good night’s sleep. Drive to the rolling plains of Queen Elizabeth National Park with its extensive savannah grassland for amazing game viewing experience after breakfast. The park is the most visited in Uganda, and home to almost 100 mammal species and over 500 bird species. It covers almost 2000 square kilometres, and was renamed from Kazinga National Park in 1954 to commemorate a visit by Queen Elizabeth II. The drive through the Kasenyi tracks enables you to explore a range of game including the Elephant, Lion, Buffalo, Leopard and Side-striped Jackal among other species. The activity tends to last 3 – 4 hours after which you will return to the lodge for relaxation and lunch. In the afternoon, you gather at Mweya jetty for an afternoon boat cruise starting at 2pm. The encounter offers you opportunity of encountering Nile crocodile, Hippopotamus and waterbirds along the channel. The wild game also tends to come to the channel shores to quench their thirst. After the boat cruise we do a game drive along the channel track as you connect to the lodge for dinner and our night’s rest. DAY 9: Transfer to Bwindi Impenetrable National Park. Do Ishasha game drive en route in search of tree climbing lions. Embark on the drive to Bwindi Impenetrable National Park in the south of the country. Before leaving Queen Elizabeth National Park we will undertake a game drive in Ishasha sector in search of the famous tree climbing lions that tend to lie on fig tree branches overlooking their prey in the plains. Continue on the drive to Bwindi for relaxation, dinner and our overnight stay. Have breakfast at our lodge and then go to the park offices to get briefed and at 8:00am you embark on the Uganda Gorilla trek along the designated trails within the impenetrable forest in search for these great mountain Gorillas. The park is inhabited by about 340 individual mountain Gorillas, known as the Bwindi population, which makes up almost half of all the mountain Gorillas in the world. The Gorilla trekking might take you 2 – 8 hours depending on their movements. The trek/quest for these great apes is tiresome but very well rewarded by meeting, spending time with and photographing these great Gorillas as you look straight into their inviting brown expressive eyes. This is a thrill of a lifetime only Africa can offer you. After your one hour with the Gorillas, return to the starting point to embark on the transfer to Lake Bunyonyi. We drive through fascinating Kigezi Highlands where locals apply a terracing method to cultivate their slopes, making for an impressive scenic landscape. You arrive at Lake Bunyonyi in the afternoon for relaxation, dinner and overnight stay. After a relaxed breakfast, embark on the transfer to Lake Mburo National Park (199km), a 4 hour drive to the Northeast. A lunch stop will be made at Igongo Cultural Centre before proceeding to enter the park through Sanga Gate. Do an evening game drive as you head to your lodge for relaxation, dinner and overnight stay. DAY 11: Do morning walking Safari & transfer to Kampala. Make a stop at Uganda Equator crossing at Kayabwe. After your early morning breakfast, you will undertake a nature walk. This is one of the most interesting game walks in the country that will expose you to various species of primates, birds, antelopes like Eland, Waterbuck, Impala, Topi, Bushbuck, Klipspringer among others, as well as Buffalo, Rothschild’s Giraffe, Burchell’s Zebra and Warthog. All this in a beautiful savannah landscape dotted with great Acacia trees. After the walk we embark on the transfer to Kampala (240km), about 3 – 4 hours’ drive making a stop at the Ugandan Equator crossing at Kayabwe for magical photos where you can stand with one leg in the Northern hemisphere while the other remains in the Southern! It also an impressive site for purchasing memorabilia to take back home as a memento of this incredible safari in Uganda.